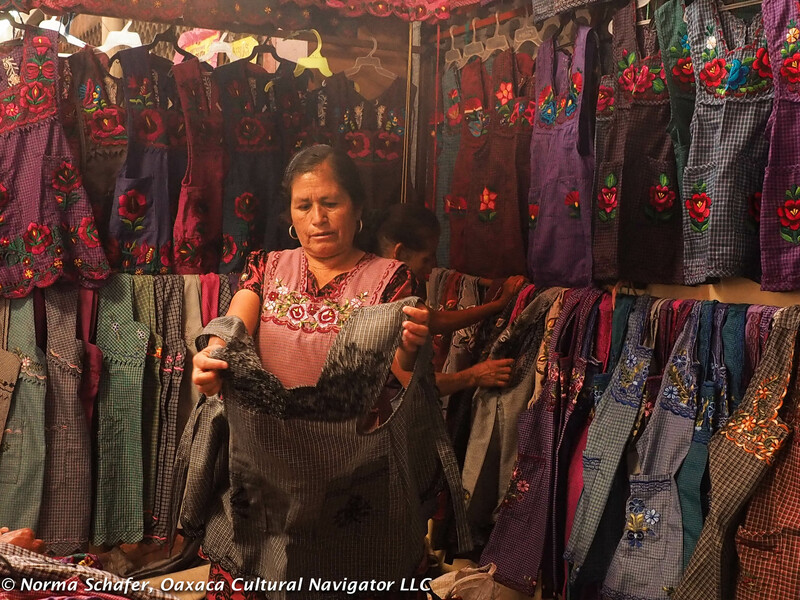 This entry was posted in Cultural Commentary, Textiles, Tapestries & Weaving and tagged aprons, class, clothing, cost, Embroidery, fashion, identity, Mexico, Oaxaca, social status, Tlacolula market, Women. Bookmark the permalink. I am interested in purchasing for my e-boutique. Norma, that first photo made my heart jump. What an amazing picture, thanks! What an amazing compliment coming from you, Flo, the consummate pro. Norma, that first photo is spectacular – it is almost like a painting one would find in a museum – the lighting is amazing. I have a couple and wear one all the time — when cooking, cleaning, gardening, you name it. 😉 They remind me of my grandmother, who used to make and wear a similar bib-style apron everyday. Wonderful how these things evoke family memories, Shannon. Thanks for sharing. 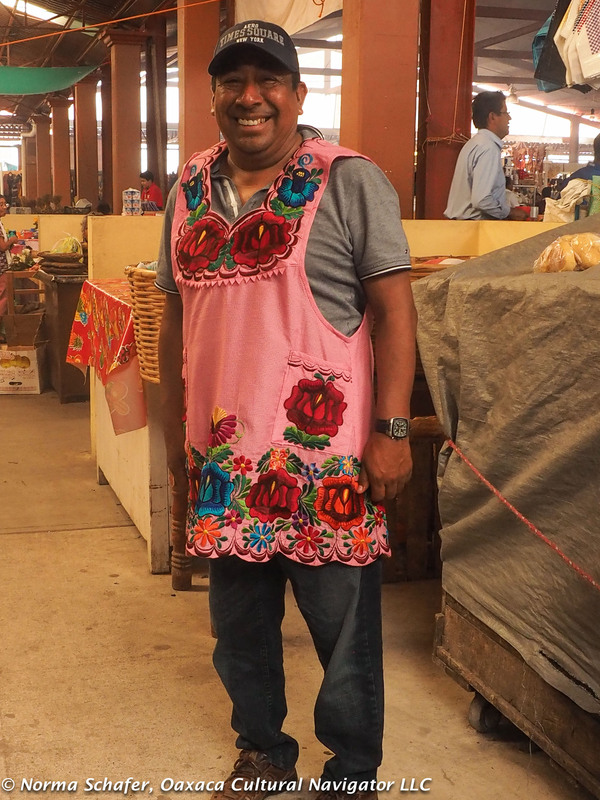 First thing I bought on the first morning in the Teotitlan market was an apron like Rosario’s. I use it all the time. I often keep it on when guests come as an opportunity to talk about Mexico. Thanks, Ruth. Yes, a great conversation starter about how wonderful Mexico can be. Thanks for posting this Norma. 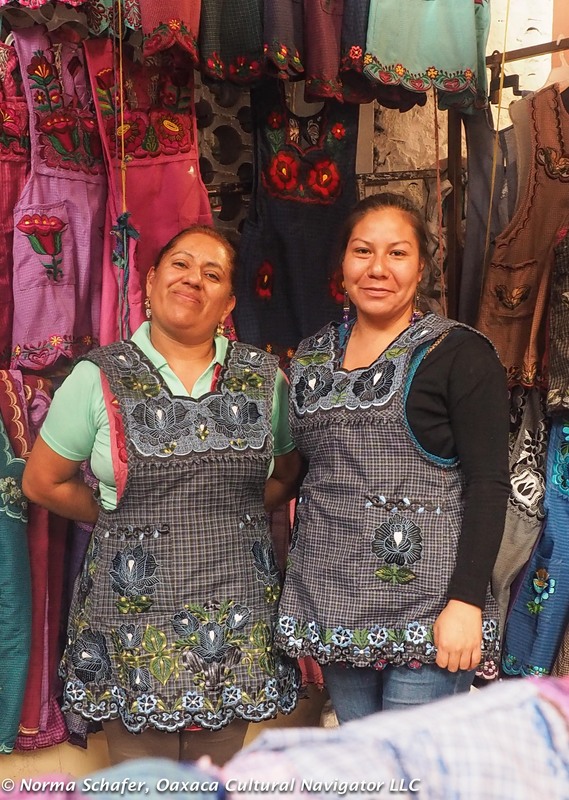 I have two aprons that I bought while in Oaxaca and I absolutely love them. The utility far surpasses anything here in the states. I can see why they are so popular. So happy to have triggered fond Oaxaca memories, Mardi. 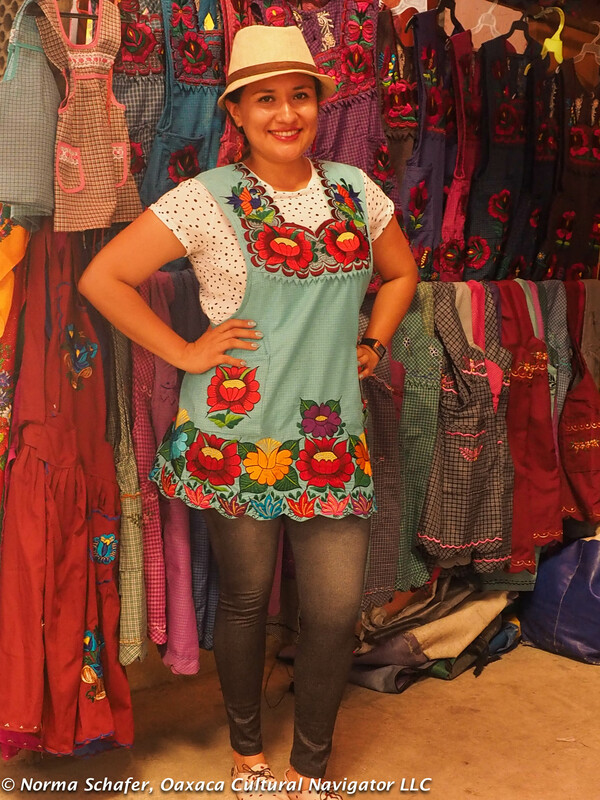 I treasure my aprons from Teotitlan, especially the one I purchased from Magda at Las Granadas B and B. I wear it almost daily. 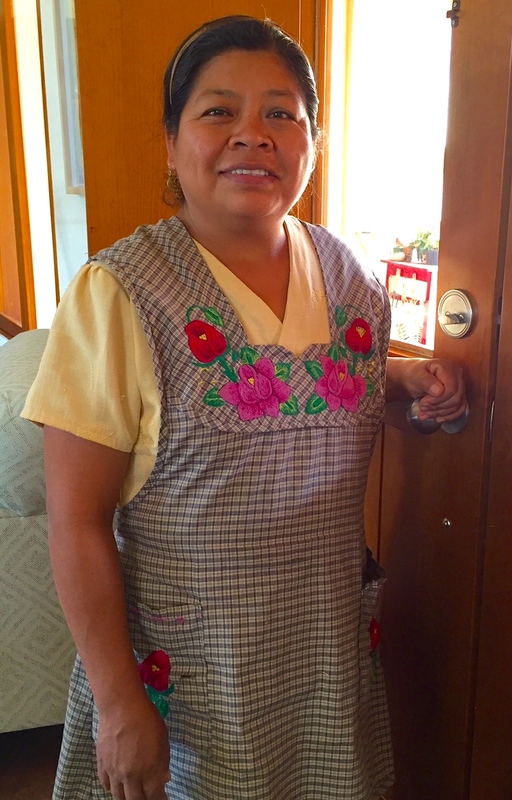 I feel connected to Mexico! 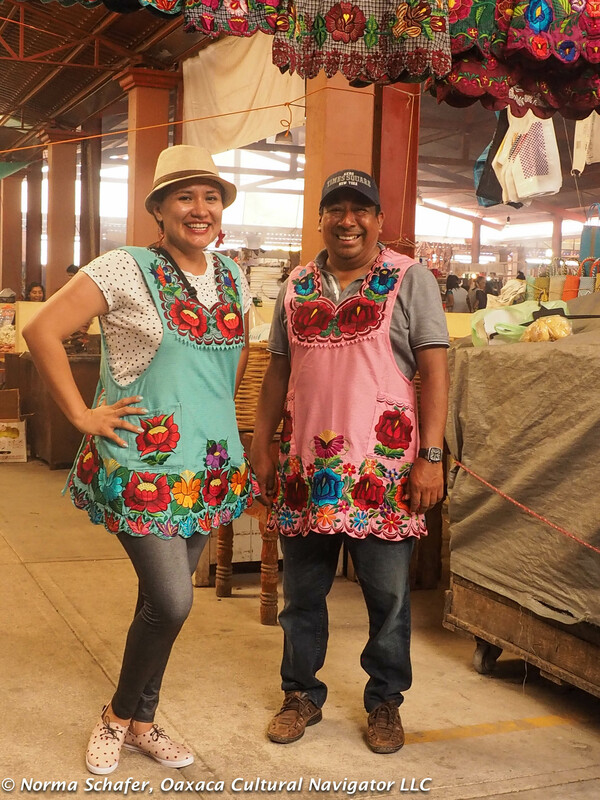 There you go, aprons as cultural connection! Thanks for sharing Claudia. Thanks for the interesting post and beautiful photos. We can always trust you to come up with a unique angle on daily life in your part of the world. 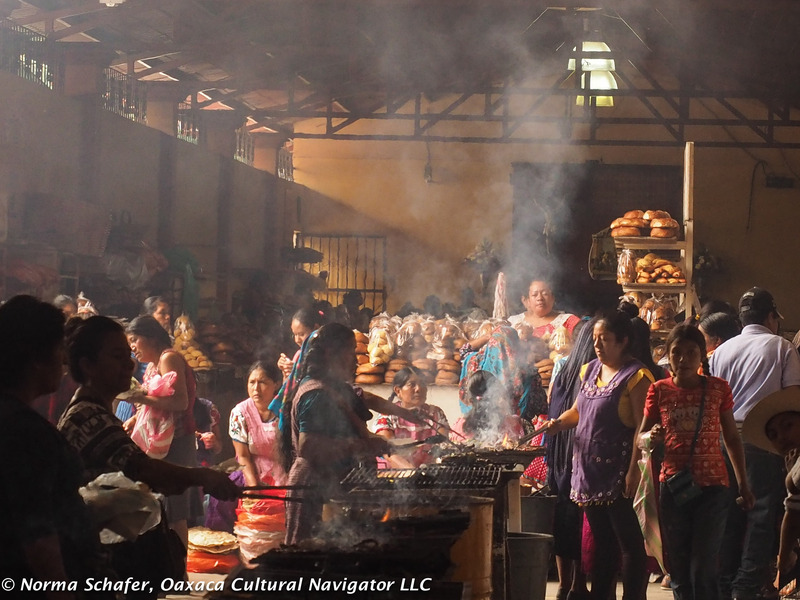 I loved all your photos but the one of the market scene at the top is wonderful with the smoke and the light and shadows. Congratulations on your new high tech connection. I’ve always been in awe of your output–both the quality and quantity but after reading about your previous constraints I am even more awestruck. Looking forward to your future posts. Thanks for explaining the apron addiction. Wish I had bought a few for home! Thanks for explaining the apron addiction. Wish I had bought a few to bring home! Thanks, Sue. Yes, aprons are like the frosting on the cake here. I’ve restrained myself to three. Hard to resist, though. Come back and go shopping! The aprons are wonderful, as are the skirts etc. that go with them. Such a special part of the art and culture. Thanks for sharing. Thanks, Susanne. Yes, they are fun! Sometimes, a woman’s wardrobe is mostly aprons.